I just came back from burying the dead. I had been gone too long but it couldn't be helped. I needed time to accomodate the wealth of Filipino customs and traditions that I had no idea accompanied funerals and burials. It seems Christ's biblical exhortation to let the dead bury the dead is unheeded in this largely Catholic nation. Nonetheless, I deeply respect tradition and I have chosen to follow its requirements among people who believe in them. Besides, Filipino SOPs for the dead are interesting cultural elements to mull over. Tradition begins as soon as embalming ends. The body is dressed in white or cream. Shoes are also prescribed but are only placed beside the body and not worn on the feet. It is believed that the wearing of shoes will encourage the soul to roam in the dead of the night which could cause some of the weak-hearted relatives to suffer from heart attacks. Aside from a rosary around the wrist, jewelry and accessories are not included. This is not because of any known superstition but because the relatives know that desperate gravediggers would rather risk a visit from the incensed soul than pass up the chance to pawn what the dead cannot bring to heaven or use as a bargaining chip in hell. At this point, even before the deceased gets his make-up and forced smile in place, family feuds can begin. Arguments can range from the proper placement of the water dispenser in the funeral parlor to who should get the largest cut in whatever is left of the dead person's backyard poultry. In the meantime, while the war over dispensers and pigs rages on, the wake commences. In remote areas, the wake can last for as long as nine days. In urban areas, the body can be buried after 3-4 days but the final vigil is often held in the family home and nine days of prayer and sleepless nights continue to be observed. On these days, a local prayer leader recites nightly prayers at the speed of light in a seemingly esoteric language that only the most ancient in the assembly can make sense of. After the prayers, the family of the dead is expected to serve refreshements. Since the sense of loss is magnified by the day due to dwindling funds, the cheapest food options are often resorted to. That would mean serving biscuits that taste like pure sugar and instant juices that only taste like real orange juice but don't really contain the pictured fruits on the packs. The food is a gentle reminder of how and why the deceased died of the complications of diabetes. While family and friends gobble up all the sugar and artificial flavors, they recount the dead person's numerous merits and final days of agony while discretely wondering why so and so didn't die instead. What follows after is hours of drinking bottomless coffee or alcohol accompanied by small time gambling. This, they say is the living's way of accompanying the dead on his final journey. For many though, the noise, the presence of many and the entertainment are really the living's way of dulling the pain, escaping real or imagined visits from the dead, speeding their own demise and winning a few coins for the trip back home. In the morning, those who stayed up all night invert their biological clocks by sleeping. On the ninth day, a small feast is prepared. In some cases, small plans have to be abandoned on the spot. This is tha day that relatives to the nth degree and acquiantances that family members can hardly remember encountering can suddenly pop up to offer their condolences and partake of the feast. The change of plans might require the early death of the chickens in the backyard. The alternative is to break the piggy bank to buy more food in which case filing for bankruptcy must follow. On the day of the burial, family members dress in white or black. Black used to be the traditional color. Thanks to the Chinese and the infernal Philippine climate, white has become the preferrred color. 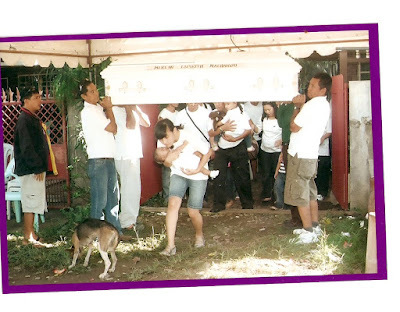 Before the procession to the cemetery, the casket is lifted in front of the house entrance and everyone in the house is asked to pass under and never look back. I did look back. I surmise that I am now to expect years of bad luck. (This is already to be expected though even if I were not cursed. The current state of affairs in our country has placed everyone in perpetual bad luck). In the cemetery, a mass is held before the body is buried. Current financial limitations have forced many families to let their dead rot one over the other in individual cemented cases. My colleague's relatives however believe that stacking can lead to successive deaths in the family. This is why the family has had to deplete their resources even more for a separate single lot in a memorial park that's excrusciatingly posh. The figures in pesos can harden the arteries. As the casket is lowered, a few relatives wail uncontrollably, vowing to follow their beloved soon, just not on that day, although a little forward step can easily send some of the more violently afflicted right into double internment. After the soil is shovelled in, names of the family members written in decorative ribbons are burned over the topsoil in an effort to yet again avert bad luck and tragedy (If every bereaved Filipino family did this, maybe the country can be saved from sinking). Everyone is afterwards treated to more food. None of the extra food is to be brought home. Fresh food is prepared at home and eating resumes. After the burial and the nine days of prayer, forty days are counted from the day of death. On the fortieth day, more prayers and food are prepared. More of that on the first year death anniversary afterwhich the grieving family members can begin to pick up the pieces and start living again while waiting for their turns to fertilize the soil or pollute it depending on the amount of chemicals their bodies have accumulated in their lifetimes. Throughout everything, the old and the young are in separate mental and emotional quarters. They all miss the dead but the new generation resents the ever growing number of required customs, traditions and superstitions while the old feel slighted by the rebellious disbelief of the young. It's obvious. When all the old ones pass away, the young will begin to kill tradition and superstition. This is after all a day and age when logic is expected, where a reason for everything is required and where people are asked to report back to work 3-5 days after losing a loved one. The time will come when the dead will truly have to bury their own. The last funeral I attended was my maternal grandfather's. I don't remember it being all that intricate, but the ever-present family feud was there. Huh. It actually lasted for about two years - imagine that. online funerals. haha. nearly everything can be done online these days that i wouldn't be surprised if they came up with that. hey i'm glad you feel that way about traditions. i seriously doubt though if you would feel the same way if you had to go through what i just described. many of the young ones who attended vowed to cut tradition. surprisingly, i feel a little sorry that they feel that way. can't say i blame them though. the demands of modern life have made some traditions inconvenient. tsk, tsk. These are all bittersweet truths, and the traditions that are all too familiar could not have been delineated any better. May God continue to give strength and comfort to the family and loved ones. And replying to your comment on my blog, umm I forgot to update you on what's been going on. See, the new mod, Brother TJ, "revamped" (that's his term) the Campus. He held a screening for both the old members and the new ones. So students with no previous experience in the CO were allowed to be editors. The results of the first screening were released last week. Among those who passed were me, Alex Barlaan (he applied for EIC)Jan Barlaan (literary), Jason Dacuyan (Brother TJ says he wants him to be "associate editor" or something), Janine Guibone (applied for Managing Ed), Nerick Jason Tan (Fil-Chi Dept), Joseph Young and lots of other people you probably don't know. The people from the old staff who didn't make it (cuz they didn't show up for the first screening) are Denise Gadia and Rachelle Uy, I think. Anyway the first screening was written, the second was the interview. Brother TJ says he has the final results already but he's waiting for Sister Lourdes to arrive (I think she's in Manila) before he can release them. But he says we'll know the results next Monday, during the flag ceremony. He told me it would be "a surprise".